Assignments. 349 Troop Carrier Group, 1 Nov 1943-31 Jul 1946. 349 Troop Carrier Group, 27 Jun 1949-2 Apr 1951. 349 Fighter-Bomber (later, 349 Troop Carrier) Group, 13 Jun 1952; 349 Troop Carrier Wing, 14 Apr 1959; 940 Troop Carrier (later, 940 Air Transport; 940 Military Airlift; 940 Tactical Airlift; 940 Air Refueling) Group, 11 Feb 1963; 940 Operations Group, 1 Aug 1992-1 Jul 2009; 29 Apr 2016-. Stations. Sedalia AAFld, MO, 1 Nov 1943; Alliance AAFld, NE, 20 Jan 1944; Pope Field, NC, 11 Mar 1944; Baer Field, IN, 7-15 Mar 1945; Barkston, England, 3 Apr 1945; Roye/Amy Afld, France, 18 Apr-13 Jul 1945; Bergstrom Field, TX, 17 Sep 1945-31 Jul 1946. Hamilton AFB, CA, 27 Jun 1949-2 Apr 1951. Hamilton AFB, CA, 13 Jun 1952; McClellan AFB, CA, 14 Oct 1955; Mather AFB, CA, 1 Jan 1977; McClellan AFB, CA, 1 Jul 1993; Beale AFB, CA, 1 Oct 1997-1 Jul 2009. Beale AFB, CA, 29 Apr 2016-. Aircraft. C-53, 1943-1944; C-47, 1943-1944, 1945-1946; and C-46, 1944-1946; CG-4 (glider), 1944-c. 1946; C-109, 1945. T-6, 1949-1950; T-7, 1949-1951; T-11, 1949-1951; C-46, 1949-1951. T-6, 1952-1954; C-46, 1952-1958; T-28, 1953-1956; C-119, 1958-1965; C-124, 1965-1972; C-130, 1972-1976; KC-135, 1976-2009. Operations. Aerial transportation in the ETO during World War II. 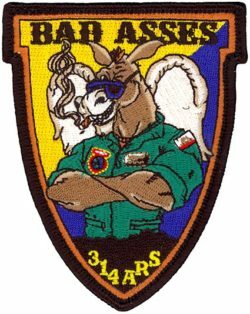 Except for brief period as a fighter-bomber squadron, trained for and performed troop carrier and airlift missions, 1949-1951 and 1957-1976. Performed air refueling missions worldwide beginning in 1977 and maintained an alert responsibility for Strategic Air Command to Sep 1991. Deployed aircraft and personnel to Saudia Arabia and European locations in support of the Gulf War and later contingency operations in Somalia and the Balkans. Service Streamers. World War II American Theater; World War II European-African-Middle Eastern Theater. Campaign Streamers. Southwest Asia: Defense of Saudi Arabia; Liberation and Defense of Kuwait. Kosovo: Kosovo Air. Decorations. Air Force Outstanding Unit Awards: 23 Dec 1964-23 Jan 1965; 1 Jan 1979-31 Dec 1980; 1 Mar 1982-29 Feb 1984; 31 Jul 1989-30 Sep 1990; 1 Oct 1995-30 Sep 1997; 1 Oct 1997-30 Sep 1999 (Meritorious Service); [21 May]-10 Jun 1999 (Meritorious Achievement); 1 Oct 2001-30 Sep 2003; 1 Oct 2003-30 Sep 2005; 1 Oct 2005-30 Sep 2007; 1 Oct 2007-30 Sep 2008. Republic of Vietnam Gallantry Cross with Palm: 1 Apr 1966-31 Mar 1972. Emblem. Approved on 28 Sep 1961; revised on 10 Apr 2006.